Q.1. How far can I see with a particular telescope? A. The answer, as many would expect, is not in terms of kilometres. In fact, even the unaided eye can see stars which are billions of kilometres away! A better way of putting this question would be: “How close is an object seen with a telescope?” The answer depends on what magnification power you are using. Roughly speaking, an object is seen as many times closer as the power of your telescope. For example, an object at 50 metres would be seen as if it were only one metre away with a 50x power telescope. Another way of saying this would be: If you can recognise a person at 50 metres with the unaided eye, than with a 50x power telescope, you can recognise him or her at 2.5 kilometres! Q.2. What is the difference that I will see with two telescopes of different sizes but of same power, for example, the Deluxe model (having 63mm mirror diameter) and Sky Probe (having 125 mm mirror diameter), both at 60x power? A. The difference is huge. In terms of brightness, the image with Sky Probe will be more than ten times brighter than that of the Deluxe model. This means a lot when you are observing faint deep sky objects. A good number of them, not at all seen with a small telescope due to their faintness, look brilliant with a large telescope. Q.3. Can I have more magnification power in a small telescope than what is supplied with it? A. Theoretically, you can. But it is not advisable. The reason is that a small telescope has a lesser limit of resolution and if by using more powerful eyepieces, you manage to obtain a very high power, you will see a dull and distorted image rather than see any more details. All our telescopes come with eyepieces that will give the maximum “useful” magnification for their sizes. Q.4. This means the bigger is the better in telescopes? A. Yes. You see objects brighter and more magnified in a large telescope. But there are certain points to be considered like air pollution. A telescope magnifies everything, including the pollution in the air it has to see through. Depending upon the level of pollution, the image tends to deteriorate after a certain magnification rather than showing more details in the object. Another thing is air turbulence. Even though the air may be pollution free – no smoke, stray light, dust or fog, it may still have turbulence in it which causes shivering of the image, more visible in larger instruments. Thus, for use in a city, the best choice would be a medium sized telescope rather than a large one. But if you plan to use your telescope in the country side where there is no or little pollution, and if you are patient enough to wait for that perfect turbulence free night, by all means, go for the largest instrument. Q.5 How do stars look through a telescope? A. No bigger. But much brighter. No telescope in the world can show stars as huge fire balls. They all show them as point objects only because of their enormous distances, the brightness depending upon the size of the telescope (the size means the aperture of the mirror or the lens, not the magnification power). Larger the telescope, brighter the stars will be seen. Q. 6 How big will I see, say Jupiter at say, 100x magnification power? A. The distance of planets from Earth is not always the same. They are seen biggest when they are closest to Earth. At 100x, Jupiter, when near Earth, will be seen about three times as big as the full Moon as seen with the naked eye. Q.7 How do I know a planet from a star? A. All planets are found in a 16 degree wide belt from east to west in which the 12 zodiac constellations are situated. You have to get a fair idea of the shapes of these constellations in order to point out any outsider, which has to be a planet. Jupiter is conspicuous by its extra ordinary brightness. Venus, the brightest celestial object after the Sun and the Moon, is always found in the west in the evening sky or in the east in the morning sky. Exact monthly positions are given in magazines like ‘Science Reporter’ or can be had from the planetarium. 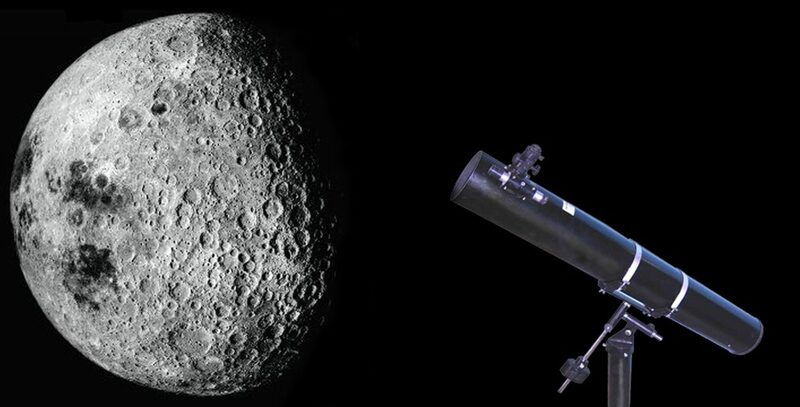 Q.8 Are the objects seen right side up in all telescopes? A. Except the Eye Spy and True Spotter, in which you see a mirror image of the object (which is right side up), all other models which are Newtonian reflecting telescopes, the eyepiece is vertical when you are looking at a land object and you can view it either straight up or upside down depending upon your own viewing position. However, in the normal viewing position, the image is upside down. Q. 9 Are Newtonian telescopes difficult to use? A. Not at all. In fact they are more convenient than the lens type refractors because the eyepiece is near the top end of the telescope tube and at right angles to it, so you don’t have to turn your neck up for viewing an object right overhead. Even a 12 year old can master the use of these telescopes. Q. 10 How ‘near’ can you see with a telescope? A. Depends on the model you choose. Generally, smaller the telescope, nearer the object that can be focused. Omni Scope can focus as short at 25 ft.
Q. 11 Can I see an artificial satellite or an aeroplane with a telescope ? A. Yes, with some practice since you have to track it continuously. You can make out the shape of the Space Shuttle or see windows of an aeroplane. Q. 12 How much area do I see in the eyepiece? A. With the Ramsden eyepieces, you can see about 40 degrees wide or about 53 ft. at 1000 yards at 40x power. The wide field eyepieces allow you to see about 55 degrees wide. Q. 13 How do I select a telescope from two or more of same size but different brands or types? A. By far the most important quality of a telescope is its optics. If the image is not sharp, no other qualities like a good and sturdy mount, expensive eyepieces, beautiful appearance or other features, though desirable, can compensate for it. Always choose a telescope which shows a crisp and well defined image at around a magnification 25 times its mirror aperture in inches. Importance wise, other features are: sturdy mounting; no vibrations, smooth movements on both axes. No backlash. Smooth focuser; adjustable cross wired finder telescope. Equatorial mount, setting circlesâ€¦there is no end to features but these are more than sufficient a beginner should look for.